Most schools in Thailand have embraced the concept of organizing English camps annually. Schools consider English camp as an opportunity for students to develop not only their English proficiency but their leadership skills as well. I have done several camps in my entire teaching career in Thailand. From primary, secondary, and even university students. I also experienced conducting camps with professionals such as nurses in a government hospital in the province where I teach. 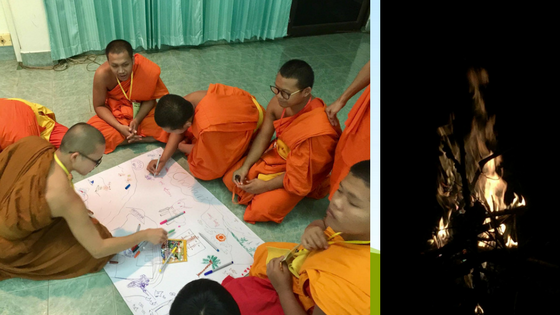 I thought I have done all, but when a colleague at the university asked me to help facilitate a camp with Buddhist monks, I realized that there are more things I have never tried. I said yes to my friend albeit conducting English camp with Buddhist monks is certainly a far cry from the camps I’ve done in the past. Firstly, I was concerned as to how am I going to deliver my activity, which, by the way, normally loud and funny. Secondly, I was concerned about whether they were the type of people who laugh out loud. Can I make them play games? Would they require me to do things in a serious manner? These were the thoughts running in my mind prior to the camp. I was even told that there are Buddhist sects that don’t like a carefree kind of activity. Now what? Cancel the camp dee kwa. 555. But fortunately, the camp came out as a success. Both monks and lay students studying at the Buddhist university gave our team (all Filipino) an approval rating. I was so glad these monks were different. They knew how to laugh at a good joke. They were open to doing things they don’t normally do at the university and at the temple. They actively participated in every activity, too. I think they really enjoyed the camp as much as we did. Honestly, it was an experience of a lifetime. I’m hoping they will include me on the list again next year.